Latest schedule at Mahasti! So many guests coming in January! What’s Your Self-Care Plan for 2018? “regular dancing is great for losing weight, maintaining strong bones, improving posture and muscle strength, increasing balance and co-ordination and beating stress” (NHS). 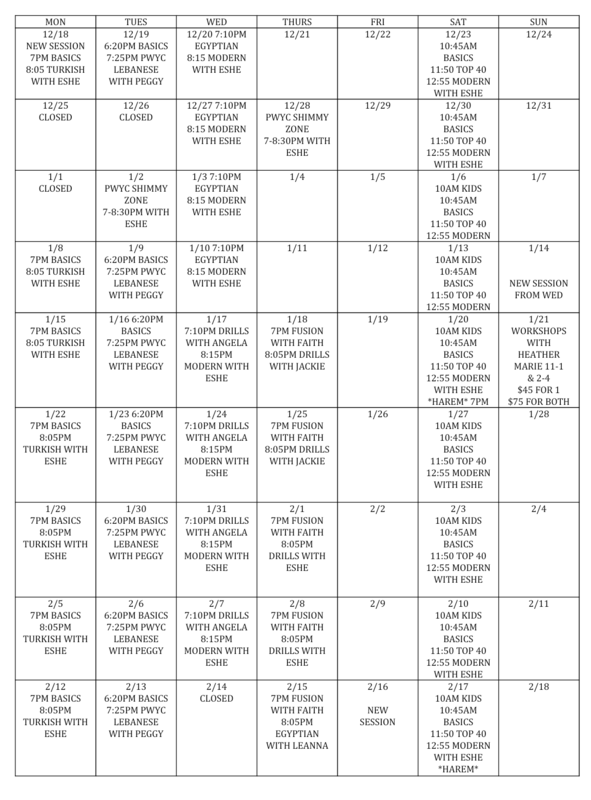 We are so excited to offer these specialty classes – good with your regular class card. Or $16 + tax drop in fee. Class cards can be purchased in sets as small as 4 for $60 + tax. 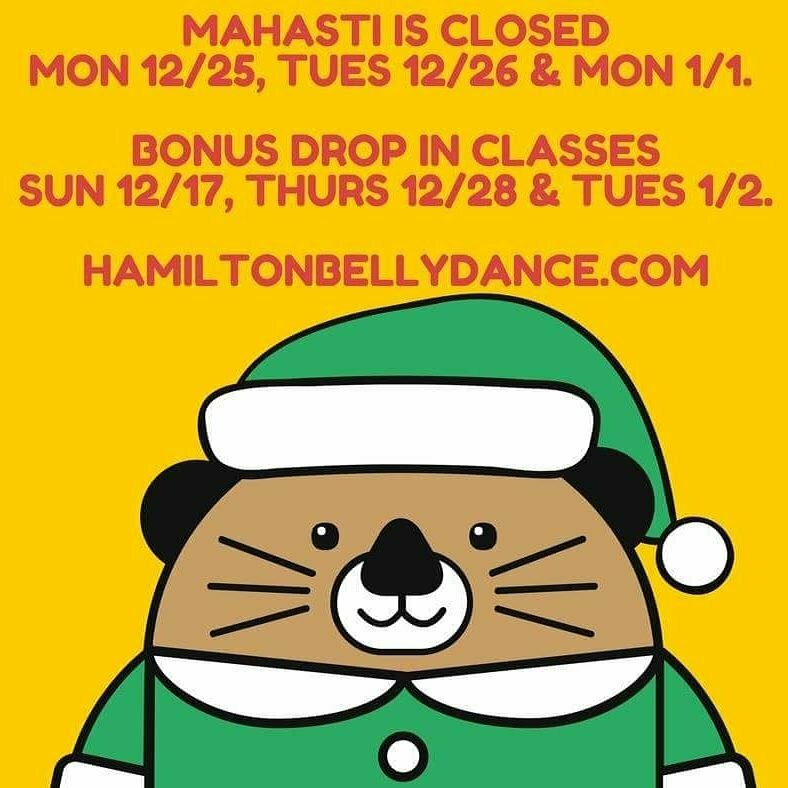 Join Angela in a four week session filled with drills designed to develop and improve your bellydance technique. This class is multilevel and suitable for dancers with some experience in bellydance. Drills will be modified to challenge all levels. Come have fun and work towards a technical repertoire that’s sharp as a tack! FRESH FUSION CLASS with Faith (4 week session in Jan, Feb, & March) from 1/18 Thursdays at 7PM. 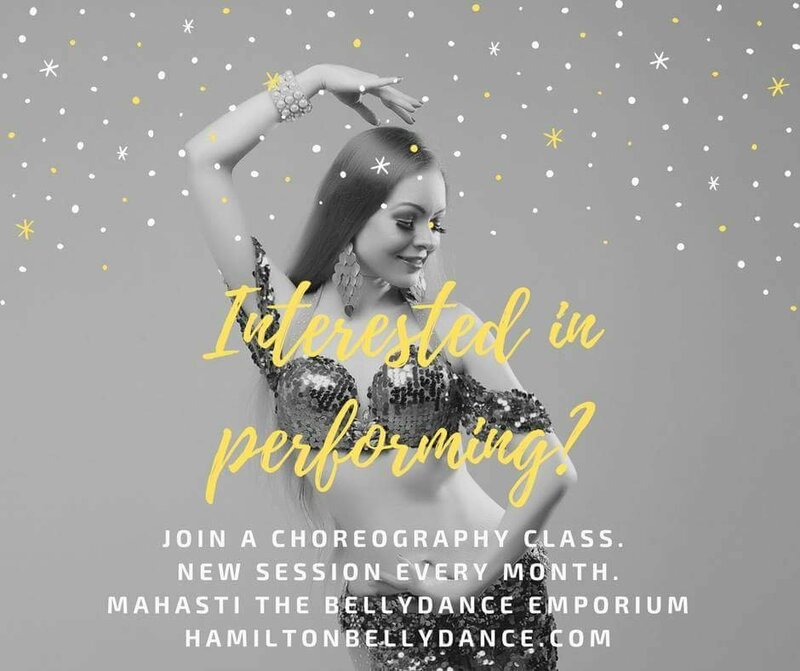 Jackie is the owner, principal instructor and Creative Director at Wild Orchid Belly Dance Studio in Hamilton, Ontario. 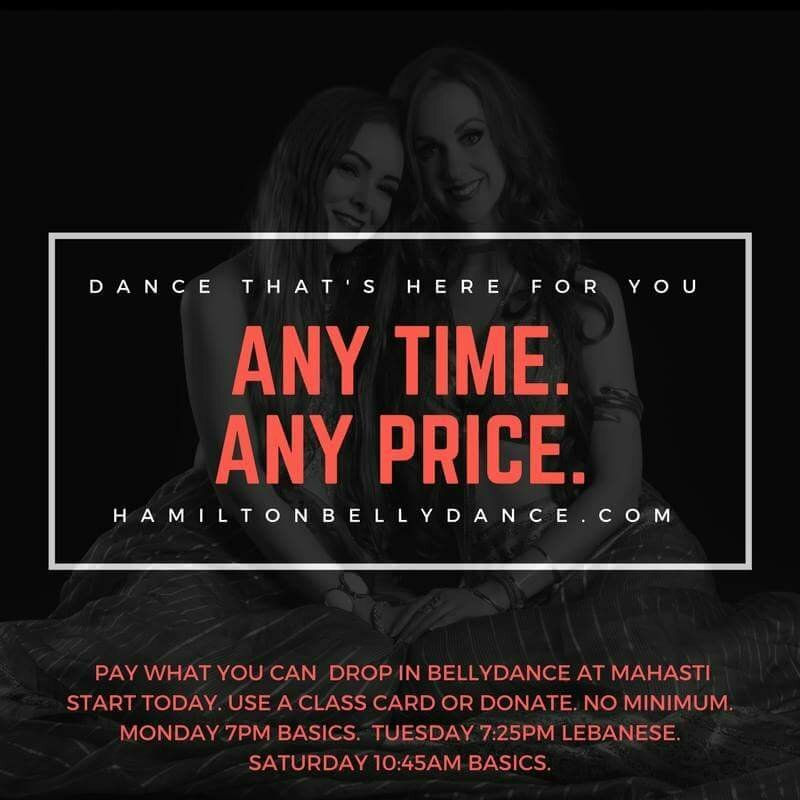 She began her studies in Egyptian-style belly dance in 2001 with Patricia Savage of Awalim Studio, Hamilton. While at Awalim, she was introduced to Toronto-based belly dancer, Audra Simmons of The Dark Side Studio, who at the time was experimenting with a modern fusion style of belly dance called Tribal Fusion. Tribal Fusion fuses American Tribal Style belly dance with elements of other dance styles including Egyptian, hip hop, modern, Flamenco and Indian classical dances, among others. She was immediately captured by the movements, music and costuming of this style and made it her goal to learn as much as she could about it. Her particular brand of Tribal Fusion blends Egyptian-style belly dance (classical and modern) with elements of jazz, hip hop, American Tribal Style (ATS) belly dance and Indian, among others. She studied extensively with renowned fusion artists Audra Simmons, Rachel Brice, Mira Betz, Ariellah, Kami Liddle, Samantha Emmanuel and Heather Stants. As a bellydancer, Leanna has had many memorable experiences. In 2015 she danced alongside Cirque du Soleil in the PanAm Opening Ceremony. This event was seen by a sold out crowd of 45,000 and had over 400 million TV viewers. Leanna was also selected to be on the CW Network Series ‘Reign’ which aired in 2017. She took part in her first full-scale production ‘Sawah’ at the Fleck Dance Theatre in Toronto. The show had many standing ovations and a huge ensemble cast of over 40 dance and musical artists from Toronto and Montreal. Other performance highlights include; the International Stage at the CNE (2016, 2017) and Dance Ontario Dance Weekend (2014-2018). Leanna also performs regularly as an ensemble and soloist with Arabesque Entertainment Agency and as part of the Yasmina Ramzy Dance Co.
Leanna‘s dedication and passion has made her a popular teacher in her hometown of Hamilton. She started BellaDance as a testament of the art forms power of revitalization and empowerment. Also giving credit to the dance having saved her as a self-conscious teenager, Leanna hopes to spread its healing qualities to her students. Watch out for local performances at The Casbah and summer Art Crawls alongside The Bellas, her dance troupe. Soheir hips, Taheya circles, and Samia figure eights. Learn Egyptian combos from the famous stars of the Golden Era of Bellydance.